We are wedding specialists. We have been creating bespoke and unique designs for our brides for over 30 years. Please contact us for a consultation with one of our trained staff members. The true love bouquet is full of romantic sentiment and dreams for the years ahead. Pink roses, pink ranunculus, lavender larkspur, lavender phalaenopsis orchids, lily of the valley, variegated ivy, lily grass blades and lush greens are beautifully arranged in a tear drop shaped bouquet. 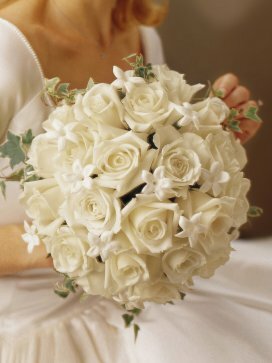 This traditional wedding bouquet is a lavish celebration of fine large-headed roses and dainty stephanotis flowers. The subtle shades of white give a sense of timeless elegance. The soft scent of this bouquet will be a lovely accompaniment as she walks up the aisle. The Contentment bouquet has an element of exotic grace set in sunlit hues. 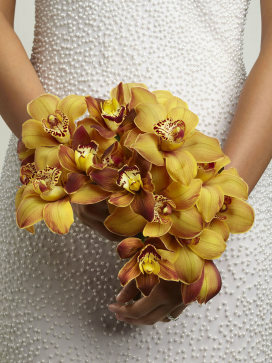 Gold and Chocolate cymbidium orchids are all individually hand wired to form an incredible display of floral elegance. Choose this stunning bouquet with its bright mix of colours, to bring a whimsical spirit to your wedding day celebration. 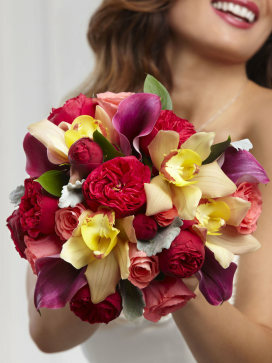 Coral roses, red garden roses, mini calla lilies and yellow cymbidium orchids are brought together to form this stunning bouquet. 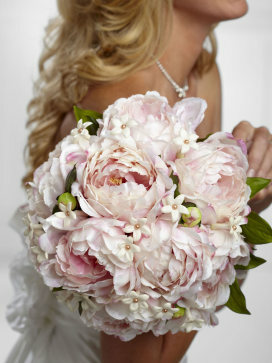 This beautiful cascade bouquet is a stunning way to make an entrance on your big day. 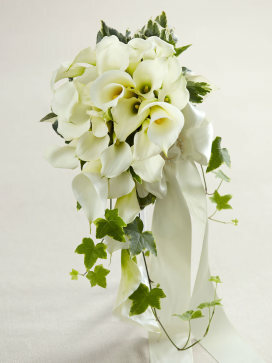 Fabulous open cut calla lilies and mini white calla lilies take centre stage accented with variegated ivy and soft satin ribbon. Lavender and anemone blooms will capture everyone's attention with their bold hues. 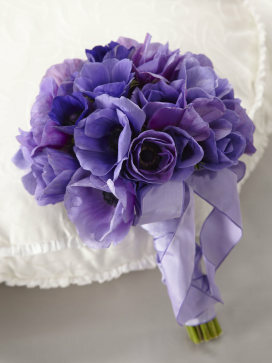 Tied together with purple taffeta ribbon, this bouquet is the perfect accompaniment to your trip down the aisle. 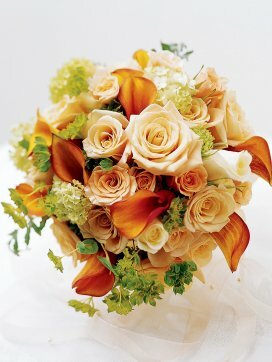 The warm tones of cinnamon, pale peach and cream make this sumptuous bridal bouquet a splendid display. These lavish large-headed roses and exquisite calla lilies have a beauty and grandeur that is just right for a wedding. 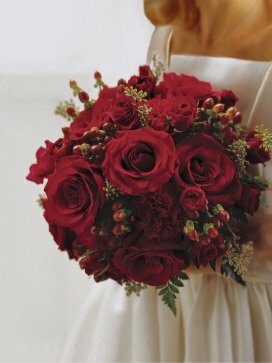 A celebration of stunning flowers in the richest reds and scarlets, this wedding bouquet is the perfect accessory for the most special of days. The exquisite arrangement of large headed roses are the pride and joy of this wonderful bouquet-and are perfectly complimented by the richly toned berries. Blooming with majestic charm, this beautiful bouquet is set to add that extra touch to your wedding day. 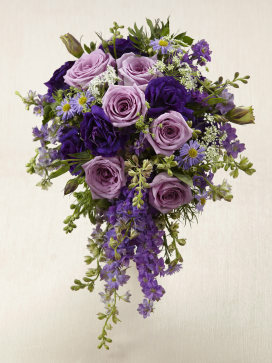 Lavender roses are offset by purple larkspur, purple double lisianthus, lavender Monte Carlo asters and Queen Ann lace to create a fabulous display of floral beauty and elegance.